This started as part of the blog on lime juice but is now one of two spin-offs. The lime juice alone was complicated enough without the origins of Punch and Cocktails. Lime juice is still very much a part of this story. Scholars have generally believed that the likeliest derivation of the word "punch" as an alcoholic drink is from the Hindi word पंज panch or panj, meaning five. Many of the early descriptions of punch had five ingredients. Of course the native word for five would have been familiar to the traders and other employees of the British East India Company. The Punjab region was named for its five rivers, though from Persian rather than Hindi. The panchamrita is the five-fold divine nectar used as an offering to the gods during Hindu pujas. It often consists of honey, sugarcane juice, cow's milk, yoghurt and ghee. Sometimes it has other ingredients, occasionally more than five. The famous Indian five-spice powder is called paanch masaala or panch phoran. Not to be confused with the Chinese five-spice powder wŭ xiāng. Another use of the word panch is in panchadhatu or panchaloha, the alloy of five metals used in India for sacred statues. One version is made with gold, silver, copper, zinc and iron. The five metals represent the five Hindu great elements. The word punch or panch in Anglo-Indian usage denoted a panchayat or local council of five members. I started this as part of the blogs about lime-juice and punch but it seemed a little out of place, so I am giving it a page for itself. Organic Seville or bitter oranges (Citrus aurantium) from Mairena del Alcor, Province of Sevilla. Being sold in Unicorn Grocery on the 8th of March 2019. Probably the last of this season. Earlier consignments were bigger, darker orange and more perfect. Apart from all the variations of punch, other popular alcoholic concoctions of the 17th century included sangaree (sangría), rosa solis and flip. Along with punch, these were the precursors to the rum toddy, rum shrub (though shrub could be used to make punch), rum sour, brandy fix, gin twist, sling, cobbler, julep, rattle-snake, stone-fence, swizzle and cocktail of the late 18th and early 19th centuries. There are many theories about the origin of the word cocktail for a mixed alcoholic drink. This meaning of the word cocktail was first recorded in 1798. I have my own theory from reading about far too many variations of the descendants of punch. The origin of the affectionate slang term "limey" for the British is usually told as though it has a long history back to the early 18th century, because limes were used to prevent scurvy in the Navy. From the 17th century on the British sailors and colonists had been famously associated with limes because of the use of lime juice in the potent alcoholic mixture called punch. Punch appears to have been an invention of the employees of the British East India Company while stationed in India. At the least, it was enthusiastically taken up by them soon after its invention. It was very quickly adopted by sea-farers of all Western European nations. In the East Indies it was made with arrack distilled from palm wine, in the West Indies it was made with rum and in Britain it was made with brandy. I have separated the section on Punch that I had written here, to keep this as simple as possible. There are many more references to the use of limes in the 17th and early 18th centuries in that piece. 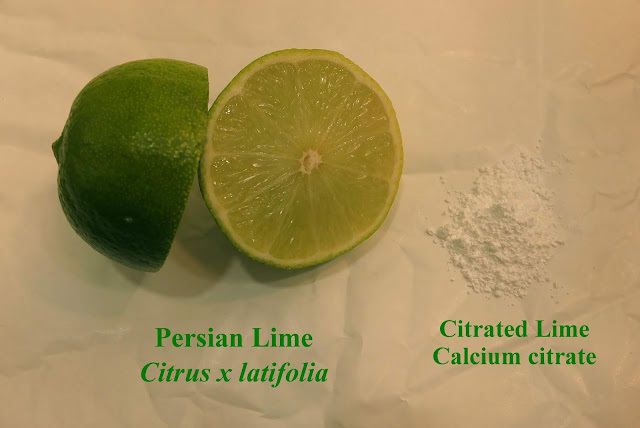 The lime fruit as a deliberate preventative of scurvy only became particularly associated with British sea-faring after 1845 when the British Government started the change from mostly Sicilian lemons to West Indian limes. There had been a crop failure of Sicilian lemons and the Government wanted a secure, British-owned source of citrus fruit. So they encouraged the sowing of lime plantations on Caribbean islands subject to earthquake and hurricanes. I grew two plants of a green Tomatillo this year. There was no name for the variety on the Suttons website. My Mum asked for a few pictures of the garden so I just popped out and took some wide shots. I will add some of the close-ups I have done in the last week. I will add a few more close-ups of plants over the next weeks in separate posts, hopefully. I have a 5 metre by 5 metre garden. Rather than constantly adding annuals and tender bedding plants I believe in putting plants in the garden that are going to continue and increase for years. Which they have been, so it is now absolutely full. On the 1st of June I was walking along Brantingham Road where it meets Manchester Road in Chorlton, at about 5pm. I saw a young man pointing his phone into a tree. I assumed he was just a fan of elder-flowers until I got nearer. I could then see a few insects orbiting around a clump on a branch of the elder tree. The young man said he had called a bee-herd. King Caradoc, inspiration for the mythical King Arthur? There was once a British King who presided over a prosperous time, ruling from the city of Camulodunum. He regularly defeated his neighbours in battle to spread his rule. 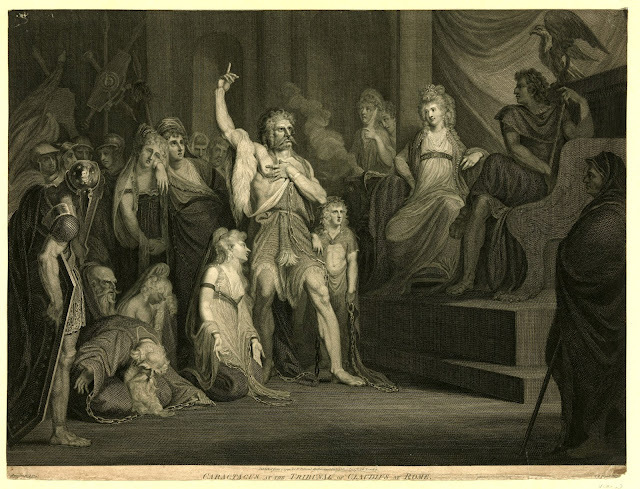 His father had already been so powerful that he was called King of the Britons. The young king fought against the armies of an invader across most of southern Britain for eight years before being defeated in a final great battle. He left the scene of the last battle alive and was then betrayed by a Queen who was having an affair with her husband's greatest warrior. The king did not die but went into exile in a far-distant and almost mythical land famous for the size and sweetness of its apples. It was not King Arthur. This king is best known as Caractacus or Caratacus, the version of his name the Romans had used. He was resurrected as a hero of the British Empire in the 19th century because of his bravery in fighting a massive Empire, being British and being a noble, well-spoken loser. Even so, he is nowhere near as famous as King Arthur. The original name is thought to have been something like Caratauc or Caratacos. It is derived from a root meaning "beloved" like the modern Welsh cariad. Old Welsh has Caratauc, which became Caradoc. Modern Welsh has Caradog. Old Breton has Caratoc. The surviving Irish form of the name of Caradoc is Carthach or Carthaigh. The modern surnames Carthy and O'Carthy come from the same name. McCarthy derives from "mac Carthaigh" - son of Caratauc. I then flipped the image horizontally, vertically and both horizontally and vertically. 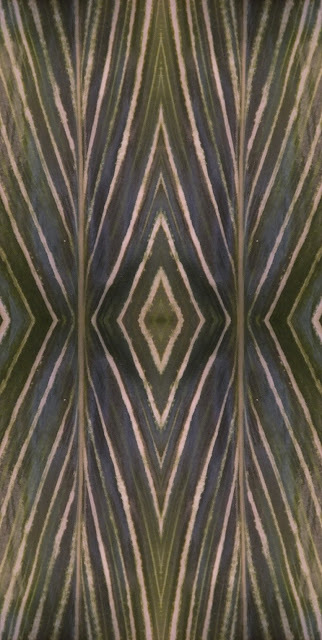 Putting those four images together makes a tile that should tesselate perfectly. I have become tired of the poor quality and intermittent availability of oyster mushrooms in supermarkets in recent years. So I bought a King oyster kit from Suttons Seeds. It arrived less than four weeks ago. It was sitting in the little propagator they provide in a dark but well-ventilated cardboard box for two weeks and near a window since then. Today I had my first harvest. They are simpler to cultivate than the common mushroom. I got 175g of edible mushroom. the end of this piece. Colours represent a mallard drake. A paper was published in the online journal Internet Archaeology* in 2016 detailing a find from the previous year at Star Carr in North Yorkshire. 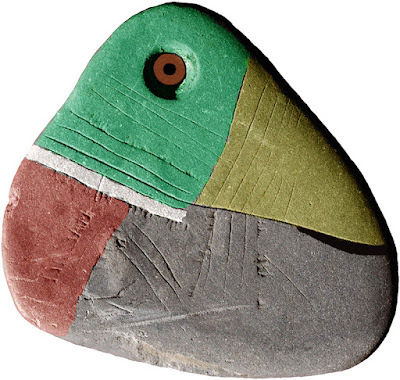 They recovered a remarkable 11,000 year old shale pendant just over 3 centimetres (1¼ inches) wide. Many interpretations of the engraving were offered but most were a bit weird. I think the most obvious is that it is a carving of a duck. The Manchester and Salford Bees appear to have been chosen as symbols for those Councils out of respect for the reforming Prime Minister Robert Peel. Peel had helped carry through the changes in local democracy that allowed the Manchester and Salford councils to be set up. He also changed the tax system to remove a huge burden on the poor against the wishes of his Party, almost destroyed the Tory Party and sacrificed his political career. By that act he changed Britain into a fairer and more inclusive country, relative to the horror show it had been before. The Manchester and Salford councils had both been ardent supporters of that law reform and celebrated Peel's success. The first Robert Peel (of the three in this story) made a lot of money from printing his designs on calico cotton cloth. His son, the second Robert Peel, made even more money from cotton and opened a large warehouse shop in central Manchester. He bought a coat of arms in 1792 with a large flying bee on the shield. The motto on the Peel coat of arms with its single bee was, simply, "Industria". The third Robert Peel, hereafter called Sir Robert Peel, 2nd Bart. or just Peel, was given a rotten borough as a 21st birthday gift by his father so he could also become a Member of Parliament. After his father became too frail to control him Sir Robert Peel, 2nd Bart decided to follow his heart and become a reformer. This was tricky as his father had set him up in the Tory party, who were mostly vehemently opposed to reform. Despite it being an open secret that he was a reformer Sir Robert Peel, 2nd Bart rose in the party until he was proposed as Prime Minister by the Duke of Wellington. The Iron Duke was so hard-hearted and against reform that he had opposed the abolition of slavery. Sir Robert Peel, 2nd Bart helped various reforms through Parliament in his first very short stint in office as Prime Minister from December 1834 to April 1835, including Parliamentary and Municipal reform. The Municipal Corporation Act came into force in September 1835, allowing the cotton merchants and other industrialists of the newly rich and populous Manchester to Incorporate and form the Borough of Manchester under their own Council. The Manchester reformers had been campaigning locally and nationally for more local democracy since before the Peterloo Massacre. That atrocious, unprovoked slaughter by cavalry of peaceful demonstrators for political reform at St Peter's Field in Manchester in 1819 was followed by a witch hunt of those who had been involved. The demonstrators had gathered at a location that is now on Peter Street between Deansgate and the Central Library. The majority of the Manchester middle class, including many "Cotton princes", were reformers, nonconformists, philanthropists and generally eager to make the country a better place to live in for everybody. Many had been poor themselves or their parents had been or they had lived among the poor. They understood the hardships of a life never knowing if you could afford your next meal. The new Manchester Borough Council was incorporated in 1838. Both Manchester and Salford Borough Councils were led and dominated by members of the Anti-Corn Law Association. They wanted to remove the tax on essential staple foods that made life for the poor precarious and miserable. The Corn Law increased by 50% the price of flour, bread, butter, meat, milk, cheese and beer (beer was a useful source of B vitamins). All the reformers were hoping that the newly-crowned Queen Victoria would be the head of a new, kinder Britain. Sir Robert Peel, 2nd Bart became Prime Minister for the second time in 1841. His second term lasted almost five years rather than almost four months. He pushed through many more reforms and jockeyed for position to repeal the Corn Law. 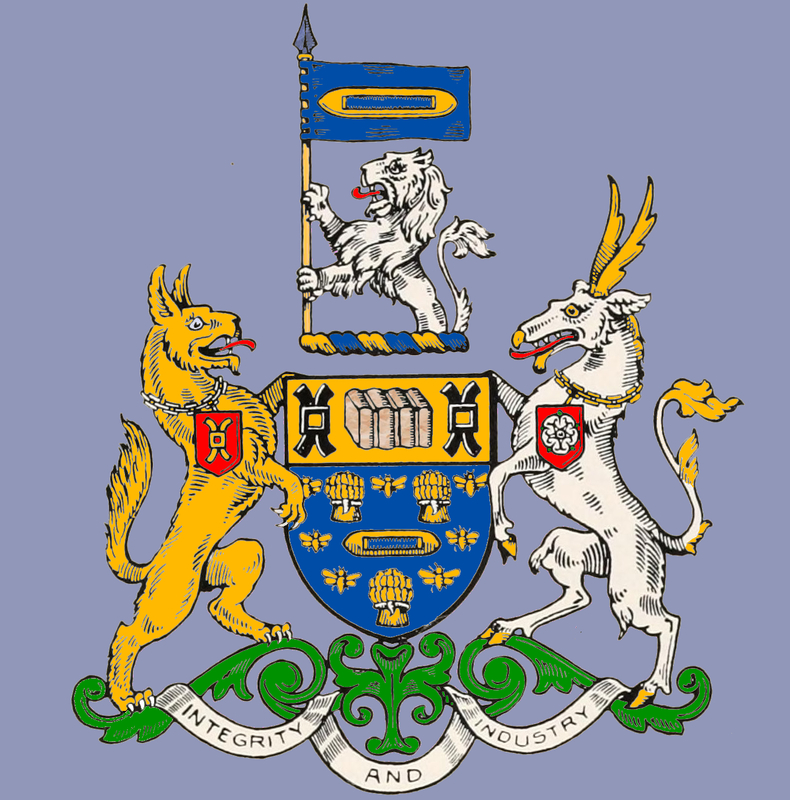 Manchester Borough Council started the process of deciding on a coat of arms in 1840 and were granted the arms on the 1st of March 1842. 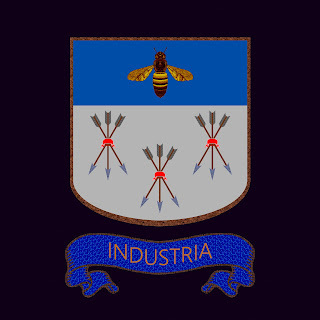 We know that the bees of the Council arms were considered to represent "industry" (note the similarity to the Peel family motto) as this was mentioned by the committee that had chosen them when the Arms were first presented to the Council. The big division over the repeal of the Corn Law was between "industry", the newly rich towns that were expanding rapidly from the profits of manufacturing, and the mostly aristocratic landowners, staying rich from protectionism. "Protection" was the term used for the taxes used to keep British (and Imperial) wheat and other agricultural products artificially competitive though unnecessarily expensive. 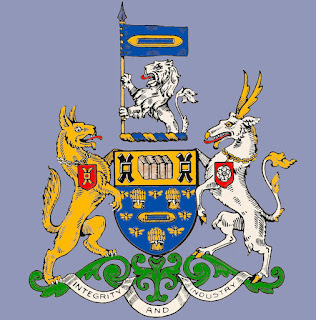 Salford Borough Council was incorporated on the 18th of April 1844, they were granted their coat of arms on the 5th of November 1844. The influence of imagery from Robert Peel's arms is even more obvious here. The crest of Robert Peel's coat of arms had a silver demi-lion holding a golden shuttle between its front paws. 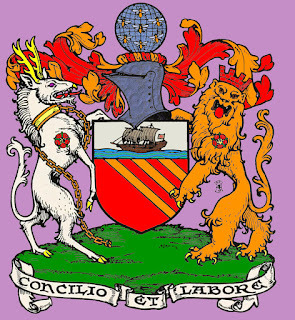 The crest of Salford's coat of arms has a silver demi-lion holding a flag depicting a golden shuttle. In Salford Borough Council's coat of arms we actually have Peel's motto Industria englished in the motto - "Integrity and Industry". The scattering of flying bees is against a pure blue background in both the shields of Peel and Salford. The wheatsheaves clearly represent Salford Council's involvement in the Anti-Corn-Law Association. They used the excuse of the arms of Ranulf of Blundeville, Earl of Chester, who used to own Salford and made it a free borough in 1229/1230. Sir Robert Peel, 2nd Bart did not finally get rid of the Corn Law until 1846, in the process destroying his political career and splitting the Tory party. Those not in the Tory party gave him great respect for putting country before party. The majority of Tories, of course, had wanted to hang on to all their aristocratic and financial privileges even if it meant provoking a Revolution as had happened in France. The arms from Robert Peel's statue in Bury. to personalise his father's arms. Statue unveiled on the 8th of September 1852. Sir Robert Peel, 2nd Bart died in a fall from his horse in 1850. Before a week had passed the Manchester and Salford Councils both had appeals in the Manchester Guardian newspaper for contributions toward monuments to honour his memory. The Manchester Peel Statue was commissioned purely from the crowd-funding appeal. It was the first public statue erected by the Manchester Borough Council and was unveiled in 1853. Quotation from Peel's speech on quitting Parliament. Reproduced on the Peel Statue in Bury and wreathed with stalks of wheat. 2nd Bart. The flying bee was prominent on the coat of arms of the "Cotton Prince" and Prime Minister who was born in Bury, 9 miles from Manchester. 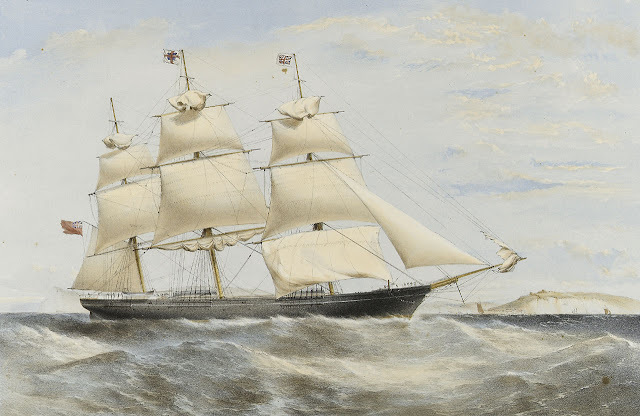 The Peel family had been one of the largest cotton traders in the area, selling their textiles from a warehouse shop in Manchester for over 50 years. Robert Peel was the politician who made it possible for the councils to exist in the first place. The man who had been a member of the Tory party for 37 years when he brought it to its knees to help the poor buy bread. The man who possibly averted an English Revolution by introducing just enough relief from the grinding oppression to make the majority of people just comfortable enough to not decapitate the aristocracy. A tradition Britain keeps to this day. Was the beehive of the co-operative movement an influence on the choice of bees as well? Certainly the co-operative movement had close connections to Manchester and their ideals would have been known to all the reformers on the Council. Robert Owen, ardent pacifist and "the father of the co-operative movement" had started his business career in Manchester. Owen's New Lanark factory experiment in cotton production introduced the concept of treating your employees like human beings. The experiment was wildly successful and made him a lot of money. The New Lanark Mill would have been well-known and fascinating to the reformers on Manchester Borough Council. John Bowring was an agent for one of the investors in New Lanark and knew Owen very well. Bowring gave the lecture that is credited with inspiring the Manchester Anti-Corn Law Association. Owen chaired the first Co-operative Congress which was held in Manchester in 1831. In 1835 Robert Owen was on the first board of the Athenæum, a club to provide entertainment and education for young Manchester men and lectures on edifying subjects for the general public. The board of the Athenæum included, among others, Thomas Potter and William Neild, the future first mayors of Manchester and leaders of the Committee for General Purposes of the Manchester Borough Council that designed the coat of arms. Labour Note from Robert Owen's Equitable Labour Exchange in 1832 showing a beehive. 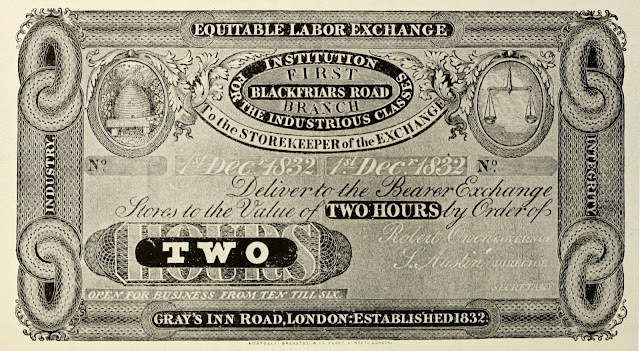 There were many more radical reformers, especially of the working class, who wanted commemorations of wilder heroes of the Free Trade and Reform movements who had campaigned for more equality, fairness and liberty. Many despised Peel who was clearly upper middle class. Though successful in his reforms, Peel was a very moderate reformer and not a revolutionary. His wide popularity with the rich merchant elite was due to that moderation. Revolution is not good for business. We do not have any direct evidence of the reasons the Councils chose the bee as their symbol. The only statement from the time appears to be that the bee represents "industry". The similarities between the arms of Robert Peel and Manchester Council and, very clearly, Salford Council seem like pretty conclusive evidence to me. It is only circumstantial evidence but when combined with the obvious high level of respect that both councils had for the achievements of Robert Peel, I find it quite convincing. If I am right, the Manchester and Salford Bee does not just stand for Industry but also represents Fairness in society, employment and taxation, Compassion for the poor or disadvantaged and Democracy hard won by decades of peaceful campaigning and delicate negotiation after a despotic government-sanctioned massacre of innocents. With a healthy dose of Co-operation and Peace being the essential foundations of the human economy and community. The motto, "Concilio et labore," which may be translated "By counsel and labour," appears to be appropriate to the circumstances of our corporation. The story of municipal administration in Manchester is told in a series of booklets under the title "CONCILIO ET LABORE." This title has been chosen not only because it is the motto of the city's coat of arms, but because it illustrates the spirit of all municipal life. A strict translation is "By Council and Labour," but a more expressive Biblical parallel is found in Ecclesiasticus, Chap. 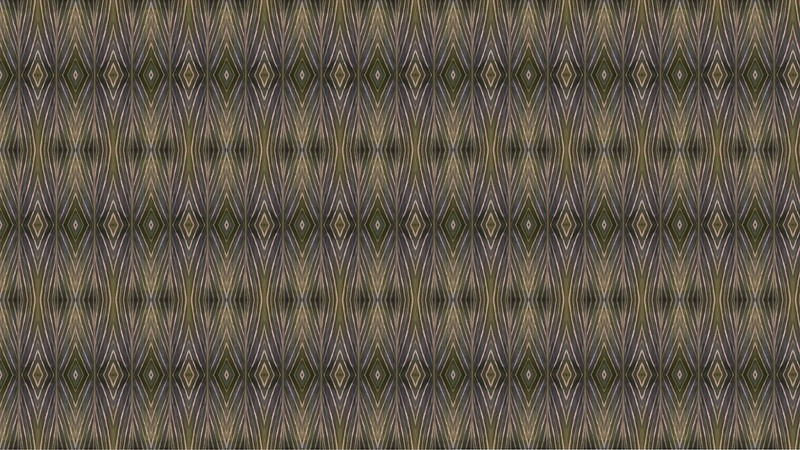 37. v, 16:— "let reason be the beginning of every work, and let counsel go before every action." Note that the author calls the biblical passage a "parallel" for the translation - not a source or inspiration for the motto. The author is merely expressing an opinion of what message the reader should take from the motto. Mottos are, of course, designed to be short, pithy and ambiguous. Unfortunately, the idea that this biblical passage is the origin of the motto has been repeated at many times and in many places since, with no reference to the source. The Latin version of the biblical verse uses the word consilium for "counsel". 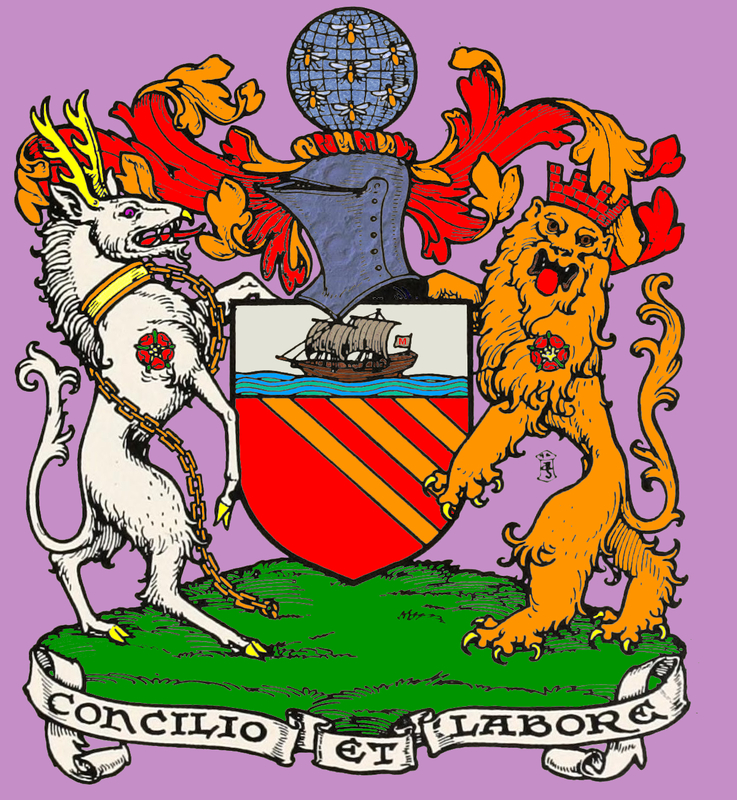 The Manchester motto has Concilio with a c rather than s, which is quite a different word, meaning "council", "to unite or bring things together", "to procure", "to make friendly or agreeable" or "to pacify" giving us our English word "conciliate". My Latin and Greek come entirely from the excellent online dictionaries at Perseus. 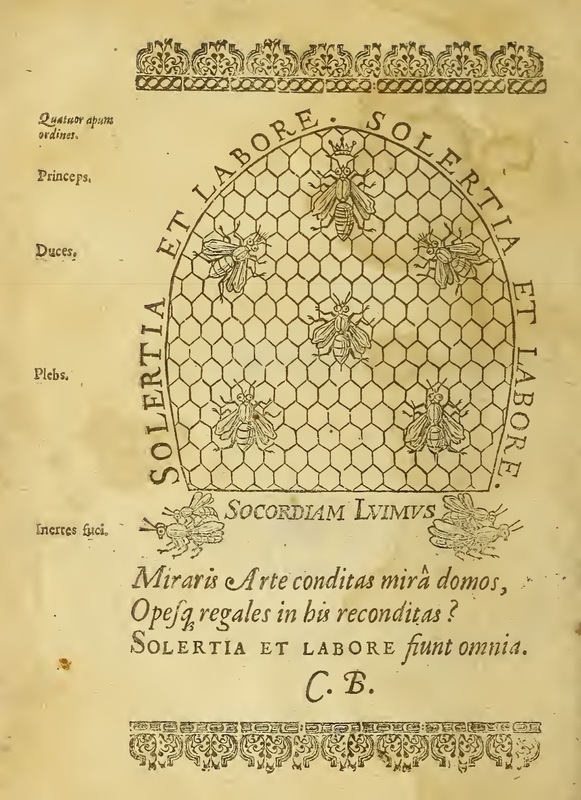 The second edition of The Feminine Monarchie, Or the Historie of Bees: &c. by Charles Butler was published in 1623 in London. The book was the second practical guide to bee-keeping in English. 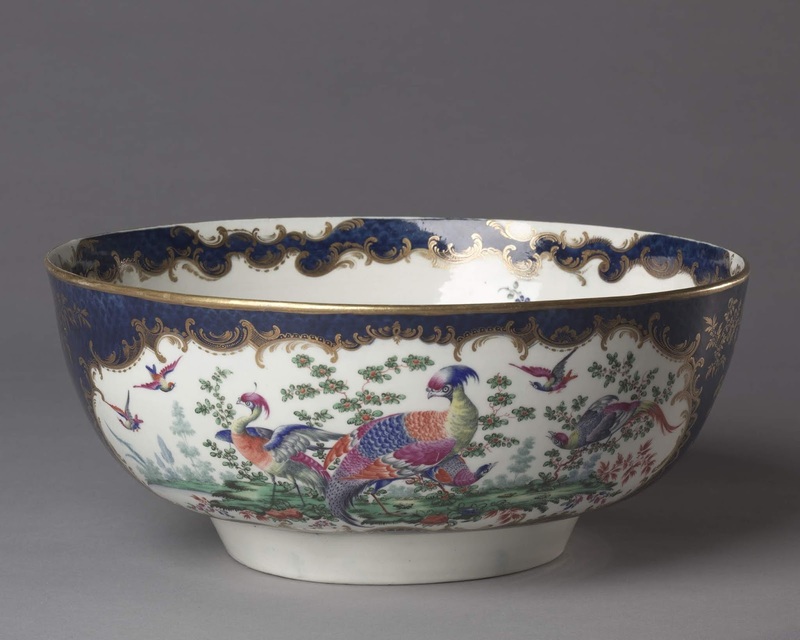 It became very popular and was reprinted regularly for centuries. 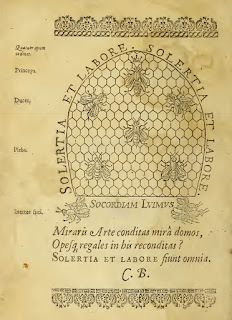 The frontispiece had the motto "Solertia et labore" repeated on both sides of a honeycomb. This is closest to the motto chosen by the Manchester Borough Council than anything else I could find in Latin on the internet. In Latin solertia can mean skill, shrewdness, quickness of mind, wit, ingenuity, dexterity, adroitness, expertness or knowledge. Royal treasures are hidden here? By skill and labour all things are made. Butler translates labore as "industry" in one edition. Charles Butler was the first beekeeper to determine by careful observation of his own hives that the Queen was female, not a King. Butler wrote: "the males heere bear no sway at all, this being an Amazonian or feminine kingdome." He dedicated the third edition of his book to Queen Henrietta Maria. Could the choice of the motto be a nod of respect by the Council to Queen Victoria and the hopes the reformers had for her new reign becoming a kinder, sweeter Feminine Monarchy? Did the members of Manchester Borough Council decide to take that bee-related motto and as a private joke turn it into "By the Council and Industry all things are made"? UPDATED 17/06/2018: I thought that I had finished this article last Sunday (ignore the date at the top of the article, that was when I started composing it online). Then I thought of something else to look up. It appears that there are two copies of Charles Butler's book on bees in the Rare Books and Special Collections at Manchester Central Library. I have emailed to book a viewing of the books this week. I also emailed the archivist to ask if they can discover where the books came from, if they were purchased by or donated to the library. The Central Library was, of course, set up by Mayor John Potter, son of Mayor Thomas Pottter who was on the committee to invent the motto. FURTHER UPDATED 22/06/2018: I saw both copies of Charles Butler's book yesterday evening. The 1624 edition is definitely not from the Potter family as it was a gift to the Manchester Library in 1965. The 1635 edition had no indication of where it had come from, except that it had been in the Henry Watson Music Library collection. It was there because it contains one of the earliest examples of printed music in Britain. The Bee's Madrigall had two parts printed the usual way up and two parts printed upside down so that four singers could read their parts together. Quite intimately, as the book is only the size of a small paperback. This article is dedicated to those who lost their lives or were wounded by the bombing at the Manchester Arena on the 22nd of May 2017 and all those killed or scarred by all the wars and atrocities throughout human history. We all just get one short life and to decide to destroy that life is an unspeakable treachery against humanity. 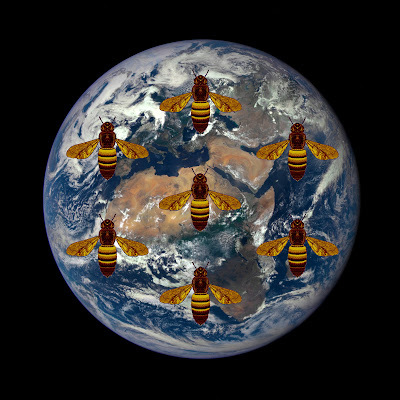 My version of the "terrestrial globe, semée of bees volant". Midsummer Manchester unusually hidden by clouds. A Swarm of Golden Space Bees can't find Manchester because it is raining. A terrestrial globe semée of bees volant, all proper. Totally ©-free. Use as you like. 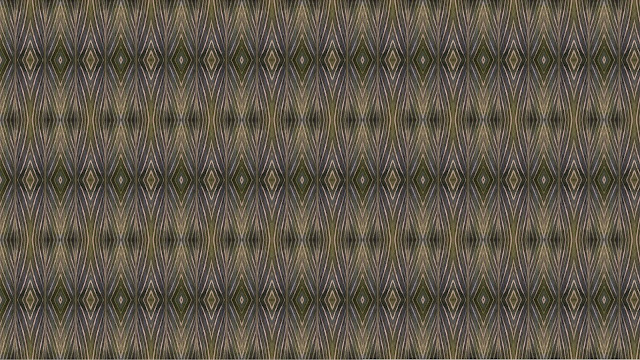 If you care give me credit. This is my interpretation of the top of the crest of the coat of arms of Manchester Council, made a little more realistic than the usual stylised heraldic cartoons such as that at the bottom of this page. I had a desire to know what it would look like done properly and realised the only way I was going to get to see it was to do it myself. Maravilla silvestre (wild marvel, botanically Calendula arvensis) is very common and widespread in Andalusia. This small wild version of the well-known garden Marigold or maravilla (Calendula officinalis) is also used medicinally, for much the same things. The flowers contain lutein, an interesting carotenoid that seems to protect the human body and particularly the eyes. The plant also contains particular saponins that seem to promote the rate of healing of wounds. Other names in Spanish are hierba del podador (herb of the pruner, as pruning tends to end up causing cuts and scrapes) and hierba lavamanos (handwash herb). They are also very pretty. I also saw another bright orange-yellow member of the marigold/daisy/sunflower/lettuce/thistle/artichoke/dandelion/tarragon/echinacea/chamomile/ragwort/dahlia/zinnia/chicory/cornflower/feverfew/goldenrod/tansy/coltsfoot/safflower/chrysanthemum family Compositae (also called Asteraceae). It is a very big family. The margarita de mar (sea daisy), estrella de mar (sea star) or padrijo (fatherson) is now known botanically as Pallenis maritima. It was previously called Asteriscus maritimus, Buphthalmum maritimum and Odontospermum maritimum. I don't know any uses for this plant apart from as a garden ornamental. The margarita de mar can spread quite a bit. Bufalaga marina (Thymelaea hirsuta) is a member of Thymelaeaceae, the same family as the popular fragrant garden shrub Daphne. I didn't notice a smell from the flowers to this example above the Cuevas de Nerja. Like Daphne, it is also toxic, though it was used as a purgative despite this. This little buttercup, the flor de san diego (Ranunculus bullatus), seems to be very resistant to being trodden on. It was growing in the middle of a footpath above the Cuevas de Nerja. Little little dragons and puffins. Arisarum vulgare is known by many names including dragontea menor, the little dracontium. The dragontea mayor or big dracontium is Dracunculus vulgaris, whose botanical name means common little dragon. So Arisarum is the little little dragon and they are all very small. Other names for Arisarum vulgare are candilicos (candlesticks) and frailecillos (little friars, also used of the seabirds called puffins). The arisarums of Andalucia include a range of intermediate forms between Arisarum vulgare and Arisarum simorrhinum (the specific name means snub-nosed). Arisarum comes from the ancient Greek ἀρίσαρον used by Dioscorides, perhaps of this plant. The Spanish plant Zarzaparrilla (Smilax aspera) is not the Sarsaparilla of commerce, which is Smilax ornata from the Americas. However the root has been used for the same medicinal effects and is famed as an aphrodisiac in Andalusia. The berries were not ripe in January in Nerja. The plant can scramble up to 10 metres hanging on with vicious thorns, though here only about 3 metres into great reed (Arundo donax). I would not recommend trying to weed it as the vines spring unpredictably when cut and wrap around digging their huge thorns into any unprotected flesh. Zarzaparrilla comes from zarza (the bramble or blackberry for its thorns) and parrilla (the grapevine for its long vines growing up supports). A small unhappy zarza or blackberry (Rubus sp.) was also growing in the shade of some great reed. Olivilla (Cneorum tricoccon), the "little olive" sounds delightful but is unfortunately quite toxic. It has been used medicinally but that probably is not a good idea. It used to be in its own family, Cneoraceae but is now included in the rue/citrus family Rutaceae. This one was growing by the watchtower called Torre de Maro at the top of the cliff by the sea. In English the olivilla is called spurge olive, here is an actual spurge, a Euphorbia of some species or other from by the sea east of Nerja. I like plants. I got a camera, I started using it. I should probably have read the manual or some tips on using cameras. No comments, please, as you know how comments are on the internet.